A customer expects the convenience of an extremely strong Plastic Bag with Die-cut Handles that are 1.25 Mil thick. These Plastic Die Cut Handle Bags resist tearing and stretching, making them perfect for any retail application. Two sized bags that we offer have Gusseted bottoms allowing room for bulkier items. 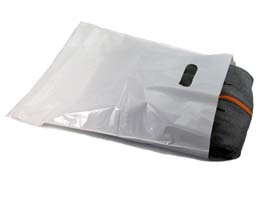 Plastic retail bag with a die cut handle can be custom made and printed to your specs. Looking for a custom printed die cut handle bag?